If the flux turns liquid in the bottle, it has absorbed moisture. It is still usable, but it is more difficult to use than in powder form. Apply as usual, but watch for the flux to turn powder then back to a liquid. 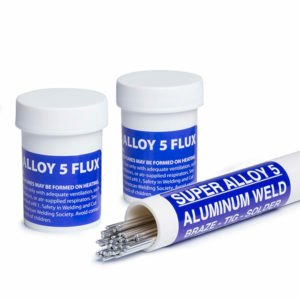 Always cap your flux immediately after use. If the rod balls up, your base metal is too cold. Knock the ball off, back the rod up, and add more flux and heat until the flux liquifies, then reapply rod.